Ireland defeated Australia 26-23 in their last game of the autumn, rounding off their fine results against South Africa and Georgia. 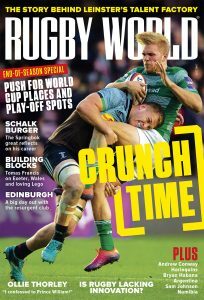 There was plenty to talk about from that game – from Joe Schmidt delivering team-talks when he should have been in hospital due to suffering from appendicitis to the fantastic defensive cameo from Ian Madigan at the end of the game – as we covered on Rugby World’s website during the week. However, away from all of that, here is an opportuinty to get a flavour for the game, the atmosphere at the Aviva Stadium and how Ireland’s autumn has gone in one super-quick video. It’s now back to Guinness Pro12 action for the Irish players. As for the Aviva Stadium, it is next in use when Leinster play Harlequins there, in round four of the European Champions Cup, 12 December. It will be the second instalment of a double-header between the two sides, with the pair facing off for the first time in Pool 2 on 7 December at the Stoop. Then, before you know it, we’ll be into the Six Nations. Ireland are reigning champions and their first game of the 2015 competition is against Italy in Rome. Then, on 14 February, they face France at the Aviva. Check out our Six Nations fixtures to find out more.